Robert Paul. 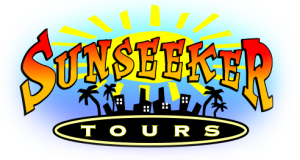 Inc., dba Sunseeker Tours, reserves the right to cancel or change tour schedules and prices without prior notice. Tour routes are subject to change and may not necessarily be driven in the order described in this brochure. We are not responsible for delays or service interruption due to mechanical failure, accidents, traffic congestion, acts of God, or other circumstances beyond our control. Robert Paul, Inc. dba Sunseeker Tours, assumes no responsibility for refunding the tour fare or providing additional transportation should you not be on time to board the bus. State License TCP-19258-S.P.